My first contact with this island, the “Pearl of Africa” was through many Mauritian students in Dublin University in the early sixties. They impressed me tremendously because most of them spoke French and English and played calypso type music. For some reason I assumed that Mauritian Indians were culturally very advanced and westernized compared to us in Kenya. All I knew was that the French ruled over them long enough to dye them in their culture that the long British rule could not alter. On 4 May 1997 I visited the Geneva Book Show. I saw a number of authors dedicating their books. In a small stall I saw a pretty young lady dressed in an orange-pink sari sitting behind a stack of orange books. 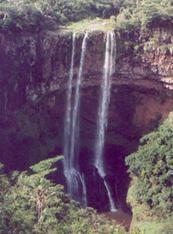 Ananda Devi comes from the Island of Mauritius. I had met her before; but I did not know that she is such a gifted and well-known writer. Ananda Devi graciously dedicated her book, L’Arbre Fouet, (L’Harmattan, 1997) to me “Avec les amités de l’auteur”. The story of a girl tormented by a Hindu tyrant father the type of which I could not imagine to exist in modern Mauritius. Such fathers I thought exist only in the caste-ridden India and not among people who had acquired the French and English civilising contact over such a long period. I telephoned her to express my appreciation of the extraordinary literary quality of her book but was critical of her basing the heart-rending story on the “outdated” Hindu customs. I was afraid that westerners would think that such nefarious practices continue among all Indians. The truth of the saying that “seeing is knowing” hit me on the face. 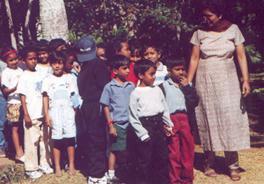 My eyes were opened only when I happen to visit Mauritius in the summer of 2001. I saw that Indians of Mauritius still live and think the way they did when they left their lands more than a century ago. I realised that Ananda Devi did not get her story from India. It is a thoroughly indigenous and a true image of her society. I have still to express my regrets to Ananda Devi for that hasty comment on her story. On my return flight I bought her newly published book Pagli (Continents Noirs, Gallimard, 2001), a story of a mad woman. Reading it I actually relived my travels in Nauritius because I had just discovered the island and its people. Air France 747 that flew me from Paris to Mauritius on 16 June was not full. Three seats behind me were vacant. Without waiting for dinner I occupied them, pulled the blanket over me and slept. I woke up just in time to enjoy my breakfast. Full of life I surveyed the island and identified a number of landmarks when the plane flew across it to land at S. S. Ramgoolam International Airport in the Southwest corner. We joined the passengers from the British Airways 747 and crowded the small immigration hall, giving me the impression that our weight might sink the beautiful island itself. My nephew, Gurprakash (GP) and his friend Suresh Nathoo, teacher of English, received me In no time I was in the town of Quatre Borne. 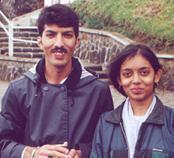 Vijayé Beeharry (Chief Inspector Schools), and Minakshi (High school chemistry teacher) live in a two-storey house on the hillside overlooking the town. After treating me to a delicious lunch of vegetable noodles, Vijayé took me to the shops and the local vegetable market. I felt being in Nairobi and India at the same time. Buildings, roads, and driving not on the right side show deep traits of British colonial Africa except that the stall keepers in the market were all Indians. I could not escape childhood yearning for Indian savouries when scent from a line of frying pans titillated my olfactory cells. While Vijayé purchased vegetables for the wedding dinner/reception, GP and I sat down in a nearby mini-commercial centre to sample coffee, which was prepared in the Indian way: quite watery. 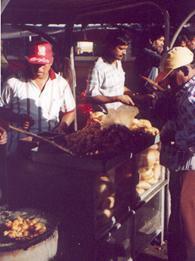 Streets are relatively clean and shopping range is vast, from the footpath stall to narrow dukas (shops) to a modern mall. I got a foretaste of the hospitality of island’s people when I phoned friends or relatives of my friends who happened to be holidaying in Geneva or Europe during that period. Each one insisted that I should spare at least one evening for them. Before the end of my first evening I had tasted boundless Mauritian hospitality. That evening we had dinner with Vijayé’s sister and her husband, Ramdhaun Jagishwar. Always happy and laughing, he seems to have acquired a knack of telling humorous anecdotes from experience as Senior Custom’s Officer. I noticed his neatly knotted ties on the door hook, which must make him look super officer. As if he had been waiting for an excuse to drink whisky, he concluded that everyone in Switzerland drinks. I could not resist joining him. With his spicy humorous stories we munched savoury vegetarian bites. Soon his jovial sister Rita, a nursing teacher, joined us and added to brother’s fun. She told me of her two children studying in Melbourne. I shared Bhojpuri Hindi, French and English often mixed; but pure Creole was beyond me except for a few words. In no time I was made to feel like one of the family, which gave them the right to make me eat a lot! Next day, I woke up at five and finished reading chapter 11 of “Autobiography of a Yogi” (1946) when Vijayé called me to the kitchen to have breakfast. He said he loved cooking and had already fried vegetable rolls. At 7.15 he took me to Arya Smaj Hindu temple of which he is the president. I watched the “Havan” (sacred fire), in fact two parallel havans, one surrounded by women only and the other by men and one woman. After singing Shanti (peace) prayer, the secretary welcomed Vijayé and congratulated him for the marriage of his daughter. A young accountant garbed in white kurta-pajamaswas then invited to give Sunday morning talk, which should normally have been given by Vijayé. He pointed out the physical differences between the two havan platforms and urged the audience and the management to do things right, to learn Sanskrit, and to pronounce consonants like “p” correctly. The message I got was that we should go back to Vedic times. On the way back Vijayé introduced me to his mother and bed ridden 90- year-old father, cared by his youngest brother Deshraj and his wife. He was the second-generation immigrant from India and had spent his life working on a sugar cane plantation. While the young were still waking up I could not resist the temptation of climbing the small hill behind Vijayé’s house, (484 metres above sea level). At 9.20, taking the back road spoiled at one spot by illegal garbage dumping, I walked through a sugar plantation (Sugar cane covers all cultivable land in the island. ), behind the police shooting range to the top. I was trying to assimilate the picturesque view around when a man doing his Sunday-morning exercise appeared from the bush on the other side. Doomun is the Deputy Director of Pay Research Board, soft spoken and kindly. He showed me all the landmarks from Vacoas and Curepipe to Rose-Hill. He told me that all the towns had expanded in the last thirty years replacing plantations. He pointed out abandoned plantations on the right side, where houses would appear soon. I took his offer to descend with him towards Phoenix and learn about the “Pearl of Africa”, which is the only speck on the globe ruled by the people of Indian origin. For that I expressed my pride. He informed me that two-thirds of the population is of Indian origin and the Government is headed by one of them. But the real power is still in the hands of a few whites that own sugar cane plantations, big supermarkets and the budding tourist industry. Deputy Prime Minister, a white, who has been promised to succeed the sick Prime Minister, is playing the game of multiculturalism by supporting religious and caste groups and thus neatly promoting division. The gap between Moslems and Hindus has widened. There is noticeable unhealthy scepticism between Hindu sects such as Sanatam Dharama and Arya Smaj. Caste differences have come to the forefront. Tendency to seek solutions to social problems in the long forgotten Indian past shows the Hindu fear to face the future. Severed from Indian, Chinese and African roots generations ago, people of all ethnic groups seem to feel uncomfortable with their new Mauritian roots. Reason for social uncertainty might be the limited scope for economic expansion in this miniscule island while the level of education has risen very high. Yet it does not explain why Indians fail to open out and exhibit the pride of rulers. The air of political supremacy does not manifesting itself in a positive forward-looking intractable Hindu. I met gentle, submissive hospitable Asians churning in their own soup. Later I was told that Hindu social and religious institutions have such rudimentary political sense that they are unfit to contribute to the overall management of society through decision-making process and shaping the policy of Government. Instead of coordinating their efforts nationally, each group hankers for small favours. Once elected, an MP receives little feedback from his electorate because institutions that would unite Hindu political and socio-economic opinion have yet to emerge. Efforts for personal promotion override all other considerations. Mr. Doomun showed me the road back to my residence in Quatre Borne. I came across country people carrying vegetables on their heads, one carting fodder on his scooter. It is not common to see middle and upper class people walking. Worried Vijayé and family, in particular GP, were pleased, rather relieved, to see me back because they wanted me to see another Havan (by a Sanatam Dharam Priest) and eat lunch organized by the neighbour, a medical doctor, seeking blessings for his new house. Many types of vegetables accompanied by a variety of sauces, pickles and chattnis, and poories served on deep green banana leaves turned out be a real treat for my hunger. Prompted by Vijayé, food servers were over generous when adding food on my leaf. A long siesta after that made me ready for the wedding reception in the evening. Before France ceded the island of Mauritius to Britain in 1810, slaves mainly of African origin and Tamil workers recruited around Pondicherry in India worked the sugar plantations. The British abolished slavery, instead imported mainly Indian and Chinese labour, who were paid but treated not much differently. Under the British rule the French continued to own most of the island, measuring about 68 km North-South and 45 km East -West (1800 sq km). 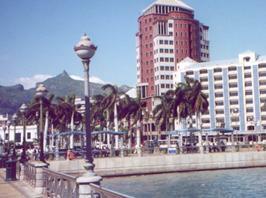 Port Louis continues to be the business and industrial centre. Cooler and healthier plateau around the picturesque volcanic crater (Trou aux Cerfs), about 20 km to the south, became white community’s residential area (Curepipe). 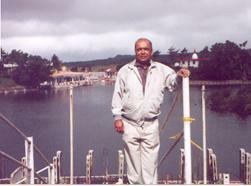 On Wednesday, 20 June, my gentle host, Vijayé Beecharry (a name obviously spelled by a British clerk when his forefathers landed in Mauritius and now pronounced as in French “Biari”) drove me in his Toyota to see the crater and Curepipe, the town where he had spent his younger days. He had frequently walked to the bottom of the crater to collect firewood. In early days while white men of Curepipe descended to Port Louis during the day, their women drove a dozen kilometres in the opposite direction to a small, charming blue lake called Grand Bassin, hidden in deep forest. Awe struck Indian plantation workers peeped wondrously, wide-eyed and open-mouthed from behind trees and viewed a scene they had not even dreamt. “Wow! White fairies landed from heaven swimming like nymphs”.They saw scantily clad white women swimming in crystal clear water or drying their “wings” in the sun like fairies. 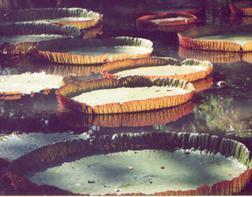 For Indians the lake came to be known as Purry Talab (Fairy Pond). Now it is Ganga Talab, surrounded by at least three Shiva temples and one Hanuman Temple. An over enthusiastic Hindu named Dyal who was then the head of the armed forces, used soldiers to build the main temple. I was told, and it is also written on a panel, that when digging they saw a brilliant light. As a consequence this temple became Mauritiuseswarnath Shiv Jyothir Lingum Temple, 13th of its kind in the world, the other twelve are in India. De facto, the temple is still run by the Dyal family and Mauritians do not like it. A little distance before Vijayé showed me the picturesque reservoir of Mare aux Vacaoas (that supplied water to the whole island at one time). 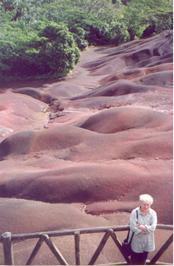 Then he took me to Alexandra Falls, Cascade Chamerel and Terre des Couleur where the evening sun lighted an exposed volcanic hump displaying seven soothing colours ranging from redbrick to light purple. One day (I do not remember when it was) a Swami walked barefoot from the north of the Island to Grand Bassin and converted Purry Talab to Ganga Talab making it as holy as mother Ganga. Since then Hindus have brought water from the Ganges in bottles and ceremonially poured into the lake keeping it “perpetually pure”. Every year during the week before Shivaratree hundreds of thousands of Hindus walk drive or bus to Talab to obtain a jug of holy water. Government had to clear the forest to create a huge vehicle park. Vijayé told me that for fifty-one weeks of the year those learning to drive use the empty parking. I saw one L-plated car hesitantly coming out of it. After visiting the temple on a hill at one end of the pool, Vijayé guided me to the steps and I descended to a paved walkway circumscribing the pool. 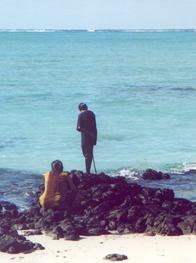 At the bottom I saw a young Hindu couple kneeling down. They tenderly floated a green leaf with a wax lamp lit on it. How innocent and devoted they looked! They watched the leaf gently riding over ripples generated by a light breeze. Standing together, eyes closed, they delicately held a small copper pitcher tilting it frugally and pouring out water as if water would continue pouring forever. How simple! How spiritual! With their nodded approval I photographed them. When I came near they handed me a piece of coconut and two bananas. Later Vijayé explained to me that it was an offering (prasad) usually given to the first person encountered after the prayer. I sat down on a concrete post and watched them finish their ceremony, while Vijayé waited for me at the other end of the pool near the main Shiva temple on the water edge. The young man, Ramsurun Purnanund and his companion informed me that they were both twenty-three years old and had recently been affianced to be married next year. He is a software expert working in a major company and the girl was looking for a long-term job. They had come here to seek blessing so that their marriage would go well. How sweet! 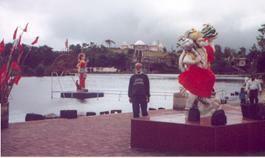 When I joined Vijayé I put my prasad on a pedestal to have me photographed between the statues of Hanumanand Parvati. A real “hanuman” (monkey) pinched one banana and we saw him relish it. I return to Sunday 17 June to finish the story of my first day on the island. The house is astir to get ready to go to the wedding reception before the guests arrive at 18.15. Vijayé’s younger brother, Prem and his wife who live nearby picked the bride in her beautifully bridal dress, GP and me in his new fully loaded BMW 325D. Prem is the Permanent Secretary to the Deputy Prime Minister/Minister of Finance. We were late. When we reached the main street a police car escorted us to the wedding hall. When I thanked Prem for the honour he confirmed that the police car was coincidental, it was not prearranged. Tastefully decorated hall was soon full with some 250 guests. The newly wed and family members sat in the middle of a low stage behind a table adorned with a bouquet of colourful flowers. I was also there proudly representing GP’s parents, Nirmal and Amrit Sohal, who must be thinking of us back in Delhi. GP looked very confident and smartly shook plentiful of male and female hands. After a short speech thanking all on behalf of Sohal’s I mixed with the crowd. A Punjabi couple, Rajni and Col. Bhima, moved forward bearing broad smiles to meet me as if Punjabis were not so common a species on the island. At one time Bhima was in charge of the army and police. He had studied in Ludhiana. They invited me home. I regret that I was unable to make it. Lovely hospitable people on a beautiful island! My urge to see more of both could hardly be restrained. Early next Monday morning GP and I boarded 8.15 bus, which zigzagged through villages and dropped us at a deserted junction just before the bridge over Grande Rivière Noire. We started marching on an empty road through sugar plantations to trek in the National Park of Gorge de la Grande Rivière Noire. In terms of the Alps or the Himalayas, places with big sounding names are not “grand” at all. We saw one man who could not understand us in English, French or Hindi. It was beginning to get hot. We had taken only one bottle of water and nothing to eat assuming, against Vijayé’s advice, that we should find restaurants on the way. Two farmwomen confirmed that we were on the right track, but they were surprised that we were walking, because people go to see the Park only in cars. Walking on a paved road did not please GP at all. Soon he was bored and started to complain. You would laugh to know that as the crow flies we were only 14 km from our house. In order to distract GP I recounted the Swami Yogananda’s story that I had read the previous night. Young Swami’s name was Mukunda. After a long stay in Benaras he and his friend Jitendra came to Agra where his elder brother rebuked him for wasting his life. “Money is first; God can come later”, said his brother. “God first, money is his slave”, responded Mukunda. Next day he sent the boys away to Brindaban, the birthplace of Krishna, with only one-way rail ticket. He told them that they must not take any money with them, must not beg, must not reveal their predicament, must not go without meal, must not be stranded there and must return to his house before midnight. Mukunda accepted the challenge, although his companion looked apprehensive. In the train Jitendra was famished and saw no sign that God was going to supply their next meal. At the station before the last one, two men joined them. They had come to collect two princes but they had not turned up. So they invited the two boys to their hermitage. After considerable reluctance the boys agreed and soon arrived at the stately hermitage welcomed by motherly Gauri Ma to a royal 30-course banquet. Jitendra burst into tears with happiness. But when they stepped into the merciless heat outside, penniless, finding no way of visiting Brindaban, Jitendra forgot the good fortune they just had and God. They stood under a tree not knowing what to do when a young man approached them and asked if he could be their guide. Mukunda declined. When the pale looking youth revealed, “You are my guru; often I have seen you in my meditation and today I saw you two standing forsaken under this very tree”, Mukunda gave in. He took them in a horse carriage to Krishna shrines. Later he gave them sandesh (offering) and a bundle of rupee notes. Well, they returned home in Agra at the agreed time and handed his brother a bundle of notes. GP thumbed the only car that passed us; it was full. We had walked about 3km and more than 2km to go when a police car came and took us to the National Park Visitor Centre where the policeman obtained for us maps and put us on the track. We walked for about an hour into midday when we sensed pangs of hunger. No sandwiches! We met an elderly English couple. 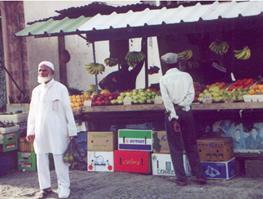 After exchange of greetings and information on the route the man asked us if we knew a plum-like fruit. He was also holding a ripe wild guava. 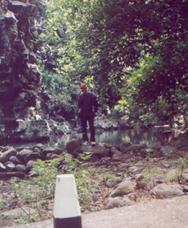 We continued to walk not far from a small almost dry stream when GP noticed a tree bearing some ripe guavas. For the next half an hour we looked sky wards for more and ignored our track. For dessert we shared a big bar of Swiss chocolate that I had in my backpack. Soon our track narrowed and branched off in different directions across the stream. To go to the highest point of the island (828m) and go over the ridge, we thought would be unwise. And to get lost on this micro-part of a micro island would be shameful. Meekly we descended to the Centre and looked for transport back to the bus stop because GP had no desire to walk on the hot road again. We had no other option. We walked two kilometres to the bridge on Rivière Noire. GP took off his shoes dipped his feet in the cool water. Just then a white van noisily braked to a stop. Out poured a dozen youths as well as loud crackling music. A few of them rushed to us and in broken Hindi showered us with question, “Are you from India? Do you know Amitab Bachan. Sharukhan …. ? ” Our hope to get a ride was almost zero because the van was packed. Any way, we asked if they would take us to the bus stop. When they were ready to go they called us. Two of them jumped into the laps of others at the back and we squeezed in with our feet on cases of empty beer bottles. A few minutes later we happily waved goodbye to the van. At the road junction is a mini market run by a Chinese lady and assisted by an Indian girl. Coke and potato crisps have never tasted that good before. GP was getting impatient. For him waiting for the bus was too long. I sensed that he desired to “fly” back. “Why can’t we take a taxi?” The shop lady had not heard of any one asking for taxi there. She laughed, “There is no taxi here; wait for the bus. It will be cheaper”. We had not finished munching a packet of crisps when a taxi passed. It did not stop. Next came an immaculate new looking unmarked car that responded to our thumb. The young driver demanded 300 rupees. I decided not to haggle too much. Happy to be seated on the leather seat GP’s smile widen progressively with decreasing distance from home! We were there at 15.30. I have a feeling that the Yogi Mukunda was watching all the time to ensure that I did not spoil GP’s happiness with my urge for adventure! We had a relaxing tea with Prem and his wife Indra. Besides other things Prem told me that Mauritius is trying hard attracting big parties to use its “offshore” banking facility. Urvashi then drove us towards Vacoas to Suresh and Tara Nathoo’s residence where we got served with starters and drinks. And then ate a good Chinese dinner in “King Dragon”. During the dinner, Nathoo, a high school teacher, expressed his fear of the rich Moslems supported by funds from abroad and of Hindu weaknesses. Out side the restaurant a Chinese girl trying to sit comfortably on a railing saw me watching her. “Now I’ve a seat. I’m tired working in the kitchen,” she said. I responded, “I hope you won’t have to wait there long. Well, thank you for the delicious noodles you served us,”. “You are still young. It’ll take a few years before you get a white beard. I assure you that my white beard does not make me wiser”, I remarked. I sensed that my kind-hearted host, Vijayé, is offended. He has seen me pack my rucksack ready to leave the next morning. He thinks that I am doing so because GP depart for Singapore that evening (Tuesday, I9 June). Endearingly he said, “Bhaiji (dear brother) I’m not going back to work till Friday. On Wednesday I have planned to take you on the southwest circuit (see 2-Fairy Pool above) and we will all go to Isle aux Cerfs on Saturday”. Well, this is how it happened. In the morning sharp at 7.45, Prem drove me to the capital, Port Louis. On the way he showed me St. Mary’s Church on the hill flank offering a beautiful view of the whole city and port. After sorting out his affairs in his office, Prem showed me offices of the Prime Minister and the Minister of Finance, then the adjoining Parliament House that stands right in the city centre. Shops open after 9.30. So I walked along the aesthetically modernized small seawater front encircled by restaurants and boutiques for tourists. For older Indians it still has nostalgic importance. They met here every evening to see the colourful sunset over the ocean. A reminder of those days is the Aparavasi Ghat nearby where immigrant men and women from India used to be lodged before being hired by white planters. Although slave trade had been abolished, indentured labourers continued to be treated like slaves for a long time. On the roadside of the ghat is the statue of a Hindu woman martyr who had fought for their rights. Immigration of indentured labourers peaked in 1858/59 when more than 44000 arrived from Calcutta, Madras and Bombay. Across the road are narrow streets with small shops that remind of those in rural cities in India and of Nairobi’s River Road. After a quick look at the vegetable market and China Town, I boarded a bus to see Pamplemousse Botanical Garden. Noise of Indian-made Tata buses and the competitive manner in which they are driven takes one back to India, except that they are cleaner and not crowded. My hosts confirmed my complaint that even in main towns it is difficult to find a coffee/tea shop where one could sit and rest over a cup and watch people. I found one in Orchard Commercial Centre in Quatre Bornes. The girl served me coffee in a cup wearing lipstick of the previous customer. She simply poured the coffee into another cup and put in front of me. It was cold and undrinkable. I decided to walk home from the town centre. I caught up with a bearded young man to ask if I was going in the right direction. Like me he was also going to Hill Crest Road. When I asked him why Mauritians do not seem to like walking, he responded promptly, “They go to their toilet in their cars!” It explains all. the car door and said, “No pay”, I’ll take you to Grand Baie”. Obviously he wanted company, someone to talk. He was very happy that I could speak Hindi. He exhibited his devotion of Krishna wearing His sign prominently on his forehead. He started to recite religious verses and Hindi poetry. Danny was from a nearby rural town of Goodlands. Overcoffee at the Supermarket for about an hour he told me about himself and people. I politely declined his invitation for dinner that evening. He offered to take me anywhere on the island! I rented a bicycle and paddled through sugar cane plantations visiting The Vale, Petit Raffray, Roche Terre, and made a tea stop in Grand Gaube Hotel, which was only I0% occupied. I cycled back along the north coast through Cap Malheureux, lined by individual houses of colonial times. When I returned to my lodging some daylight was left; so I went to the public beach and refreshed myself in the cool seawater for an hour and saw the sun set rather fast behind a glorious red thinly clouded sky. A hot shower sharpened my appetite. May be I descended to the main street too early, because music poured out of empty restaurant. Seeing a few people in Le Bentier Cocktail Bar I went in and ordered a beer. The barman said, “I met you on Sunday in the wedding reception. I’m related to Beeharry”. Ranjan’s wife Sheela joined a little later and we talked. I realized that Mauritius is very small; it is difficult to hide there! At Ranjan’s recommendation I ate next door in his cousin’s restaurant. Seafood menu (I80. 00 Rupees) was good but a bit too oily. The next morning, I cycled along the West Coast that has many hotels as well as Ganga Ghat with colourful statutes of a number of Hindu deities. At Pointe aux Piments I turned eastwards to Triolet where I encountered a thunderstorm. I continued through plantations and small villages of Plaine des Papayes, Gowsal, Chateau of Labourdonnais with its tall Chimneystack of an old sugar mill. After a quick lunch of noodles at a small roadside-eating place I continued south-eastwards to Gokoola, Rivière du Rempart, Roches Noire and finally reached Pointe de Roches Noires on the East Coast exhausted. I was not sure if I would be able to sustain the return trip. I watched the black rocks washed by the foaming ocean and listened to the roar of mighty waves breaking their heads against the coral reef not too far away. At the same time I wished that some bus or pickup would stop and offer Mauritian hospitality to take me back across the island. It was 15.00; I have to return the bike before five. Going back was easier than I thought. The head wind that had earlier slowed me now pushed me northwards to Poudre d’Or and then to Goodlands. It is an Indian-looking rural town. While having a cup of tea in a small bar I watched people and traffic in the street. School day had just finished. At every pedestrian crossing a policewoman ensured safety of uniformed children. Back in the apartment Nepaul listened to my day’s adventure. He had put a ripe fresh papaya in the fridge. I ate half of it. “Now a swim in the warm sea should cool me down”, I said. “Careful”, he warned me, “you are bound to get cramps after that exertion”. Although I had not experienced such cramps before, I took note of his warning. Water was rather cool. My first short and clumsy swim was refreshing. The second time I experienced severe cramps in both legs. Remembering Nepaul, I quickly walked out back to a palm tree. Leaning against it I watched the solar eclipse that was announced to occur at five. Partially covered by clouds it was difficult to distinguish the eclipse from the sunset. I talked the scene with a lady leaning against the next palm. She happened to be in the bus I took from Grand Baie after returning the bike. From my shirt marked “Lausanne Marathon 2000” she guessed that I was from Switzerland. She comes from Trois Torrents in the Valais, Switzerland. Later we met at Ranjan and Sheeia’s Bar for a drink and then walked across the road to share dinner at a Chinese restaurant. 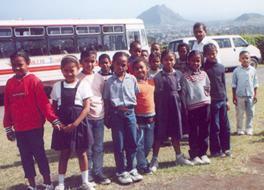 Next morning, Saturday 23 June, I took 7.30 bus to Port Louis. As agreed, Vijayé was waiting for me at Aparavasi Ghat. 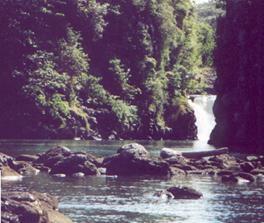 We picked up Minakshi and Mridula from home in Quatre Bomes and drove to Trou d’Eau Douce on the West Coast. A full boat zigzagged through rocks avoiding sand bars. We sawTouessrok, a luxurious hotel picturesquely set on the green sloping shore. After circumnavigating lle aux Cerfs we disembarked near the beach. There were quite a lot of tourists and fewer locals; but not crowded. In summer it must become quite suffocating. A long walk with Mridula and swimming in the cool sea made us hungry. After eating Minakshi’s tasty lunch of prathas we merited a Siesta that I appreciated a lot after previous days cycling. Vijayé brought us home at I7.30. 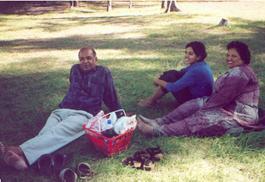 I cannot forget the evening with Mr. Madhu, Vijayé’s work colleague, and his wife Sarita. Soon I discovered that both of them were Reikki masters. I complained about pain in my neck. Sarita hinted that she would see it after dinner. I did not take it seriously. When we moved from the dinning table back to the lounge I saw Sarita rubbing her palms and putting her fingers together as if checking the electric spark. She asked me to relax in a long chair. She put her hand on my neck, for about five minutes. It seemed to have eased the pain. I was assured that a few more sessions would cure me completely. Explaining the principles of Reikki she said that it could also be done telepathically. On return to Geneva I requested Mridula to tell Sarita that my neck was still not good and I was waiting telepathic treatment! Beeharrys not only looked after me and made me a part of the family, but also went beyond to make me comfortable in every way. I carry vivid memory of visits to the local market, Ganga Talab, water falls, lakes, Isle aux Cerfs, Arya Samaj Havan, and being treated so lovingly by Nepaul and other people I had never met before. I recall memorable evenings with uncles and aunts and the lunch with Rita on the day of my departure on 24 June.